Missoula County continued to grow, adding another 1,311 residents between 2016 and 2017. While most of that growth is owed to more people moving to Missoula than moving away, net migration did see a slight decrease in 2017. Even with new rentals and single-family homes being added to the market, a growing population kept the markets for both in tight supply. Economically, Missoula experienced significant improvements, although they didn’t transfer to all demographics. Unemployment reached a low of 3.8 percent in 2018, and the 2017 median income in Missoula County increased 17 percent, to $54,311. Homeowners also saw a large jump in their median income, to $75,940. Conversely, the median income for renters declined 4 percent, to $29,793. Such disparity, coupled with rising real estate prices, illustrates the difficulty many residents have in affording real estate as well as rentals. As has been the case for several years, about 15 percent of Missoulians live in poverty. While the number of homeless individuals identified by a single point-in-time survey declined to 319 in January 2018, an estimated 500 children were homeless or in unstable housing during the 2017-18 school year, according to the Missoula County Public Schools. Missoula recorded an annual vacancy rate of 3.9 percent in 2018, which is slightly above recent years but still considered a tight rental market. Multiplexes saw a bigger increase in vacancy rates thanks to new units coming on line, but homes and duplexes had vacancy rates of 2 percent or less. Overall, rental prices declined 1.55 percent in 2018, giving renters some relief. The Missoula Housing Authority (MHA) provided 774 Section 8 vouchers to subsidize rent, but it didn’t come close to meeting the demand for such assistance. With 1,777 households on their Section 8 waiting list (up 8.5 percent from 2017), it’s clear that there isn’t enough affordable housing. No new affordable housing units were added in 2018, but MHA plans to bring on 200 new units in 2020. The pace of home sales remained brisk in 2018 but did decline by 3.8 percent, with 1,482 homes sold. The median price of a home rose 8.1 percent, to $290,000, while that of a newly constructed singlefamily home rose 26 percent to $383,500. The largest portion of sales (32.6 percent) occurred in the $200,000 to $275,000 range, and homes over $275,000 all saw an increase in number of sales. Sales of condominiums and townhouses also kept pace, though a decline in newly constructed condominiums did cause overall condo/townhouse sales to drop by 9.6 percent in 2018. The market continued its trend of having a tight supply, and competition among buyers likely contributed to rising prices. Homes under $350,000 were typically in under-supply throughout 2018. Home buying became more of a challenge for many would-be buyers in 2018. Higher mortgage rates drove up borrowing costs, and the cost of construction created financing issues for those looking to build. Foreclosures, however, remained low in 2018. Missoula homebuyers have continued access to a number of down-payment assistance programs, as well as homebuyer and financial education. However, with such a tight supply of homes at affordable price points many buyers are unable to afford to purchase a home even with down payment assistance programs. Housing affordability remains a challenge for both renters and prospective homebuyers. As the median price of a home continued to increase, the Missoula Housing Affordability Index declined. To purchase a $290,000 home in 2018 with a 5-percent down payment, a family would have needed an income of at least $95,731 to have it considered affordable. 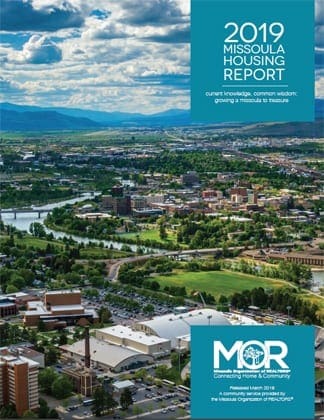 While the percentage of homeowners spending a worrisome portion of their income on housing decreased to 22 percent in Missoula, according to the most recent 2017 data, the number of renters spending more than 30 percent of their income on housing increased, reaching almost 49 percent.